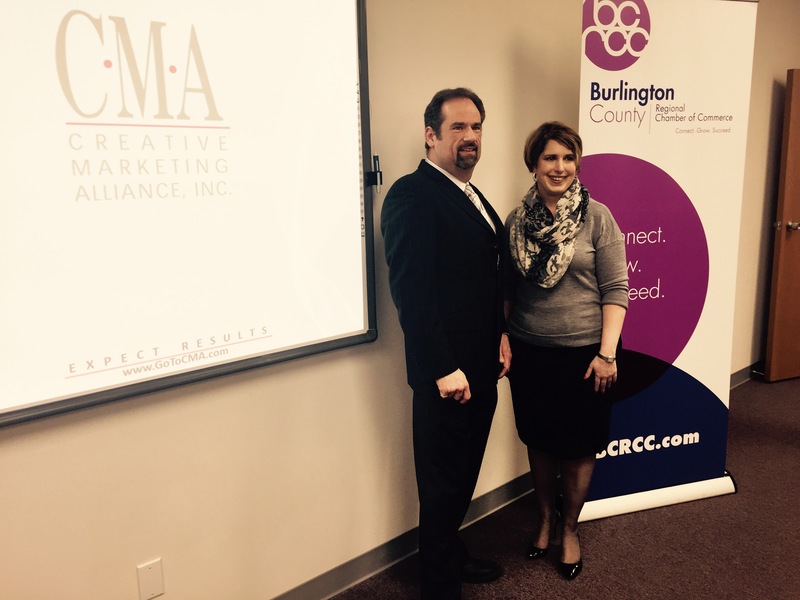 PRINCETON, N.J. – March 24, 2016 – Building a brand is building a story, said Kenneth Hitchner, public relations and social media director at Creative Marketing Alliance (CMA), a full-service marketing firm in Princeton Junction, when speaking to members of the Burlington County Regional Chamber of Commerce (BCRCC) today. Social media is a vehicle for telling that story. 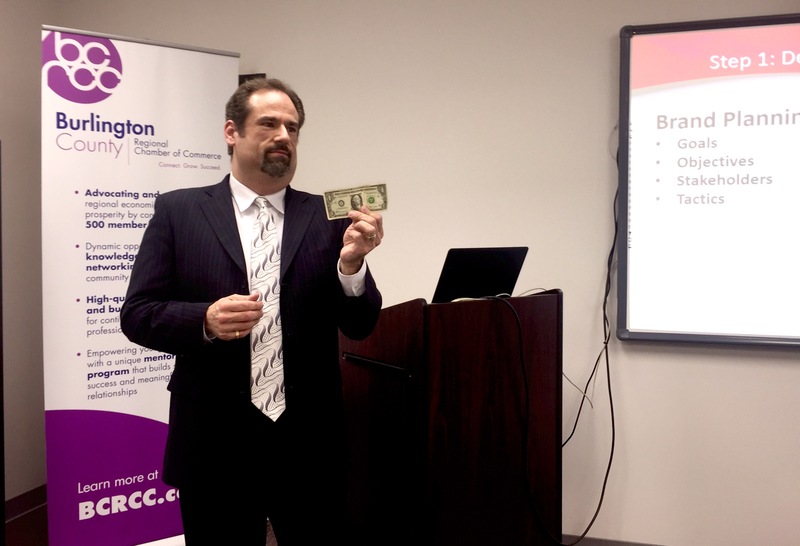 Kenneth Hitchner, public relations and social media director at Creative Marketing Alliance, holds up a dollar bill as an example of branding. He spoke about how a brand tells a story and makes a promise to consumers as they get to know it. When customers and potential customers engage online, whether by liking, commenting or sharing, it’s a sign that they like your brand and are investing in it. “People buy your story before your product, and your brand’s reputation yields relationships,” said Hitchner. Hitchner referenced on the work he did for the Professional Service Group of Central New Jersey, a nonprofit he founded to put downsized professionals back into the workforce as the example of the power of social media. Kenneth Hitchner, public relations and social media director at CMA and Kristi Howell, BCRCC president. CMA recently rebranded the BCRCC. “Every action has an equal reaction—especially on social media,” said Hitchner, who mentioned that his Instagram campaign had almost instant results with an invitation from the White House to discuss bringing professionals back into the workforce. For more information about how the award-winning CMA can help your company build its brand, visit CMAresults.com. It was a full house at the Burlington County Regional Chamber of Commerce luncheon today where Kenneth Hitchner, public relations and social media director at Creative Marketing Alliance spoke about building a brand on social media. The Burlington County Regional Chamber of Commerce (BCRCC) supports a culture where members build meaningful relationships to help advance their business opportunities through high-quality educational events and high-level networking. BCRCC fosters regional economic growth by connecting more than 500 businesses and 30,000 employees with unlimited opportunity to promote a healthy business climate. The organization invests in the future by empowering your professionals with a unique mentoring program that builds essential skills and relationships. For more information, BCRCC can be reached at www.bcrcc.com, admin@bcrcc.com or (856) 439-2520.